This Spring, JazzErie Education Committee members Dr. Scott Meier and Dr. Allen Zurcher again conducted a series of in-school Workshops for elementary and middle school students in the Erie Area. Sponsored by JazzErie and Gannon University's Schuster Foundation, the workshops represent part of JazzErie's efforts to expose area students to the excitement and joy of jazz music. Highlight of the Workshop was a live demo of improvising by the two musicians. First using a structure of simple, familiar tunes, then moving on to a free musical "conversation" using music not words, Allen and Scott played and the kids got it. Lots of questions from the kids. 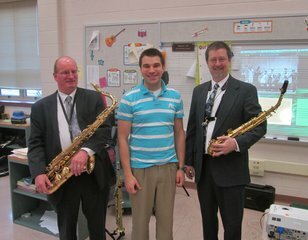 Erie schools music programs expanding. After some years of shrinkage, arts programming in the Erie school system is expanding, according to music teacher TeCulver. Erie Schools Superintendent Dr. Jay Badams is vigorously committed to expanding music and arts in Erie's schools, and continues to persuasively make his case to the School Board. More schools, like Harding, have a full-time music teacher, though a few still have teachers shared between schools. The presentation described here occurred in a dedicated Music Room. Stacked along the walls were multiple violin and cello cases, containing instruments ready for upper grade string students to develop their skills. JazzErie hopes to expand its program of in-school jazz music clinics during the coming year as well, as part of the system-wide effort to bring arts back into the mainstream of Erie public school life.